Late last month, we reported that we had received word of tightening MacBook Pro supplies, suggesting that an update to Apple's popular notebook line might be coming in the near future. 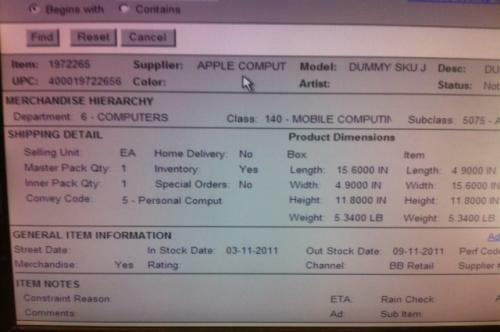 Also getting attention today is a Best Buy inventory screen pointing to a March 11th in-stock date for what may be a revised version of the entry-level 13-inch MacBook Pro. We received word of the same database entry about ten days ago, but have little faith in its accuracy, as the company did the exact same thing in early 2010, guessing at a March 14th date for new models. The update didn't actually occur until a month after the proposed date. 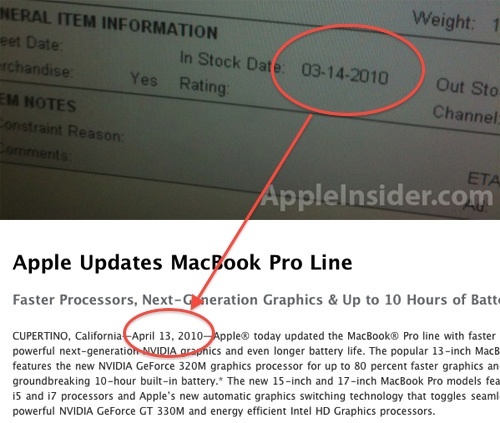 The other wildcard in the MacBook Pro update situation is Intel's "design error" that has forced the company to fix its manufacturing process for one of the chips in the chipset being used the Sandy Bridge processors presumably destined for the next-generation MacBook Pros and iMacs. A delay in availability of Sandy Bridge chipsets could easily push back MacBook Pro updates from Apple's original target date and result in an extended period of tight supplies of the current models.